Officials held a banner to announce the program San Diego Promise will expand for a second year, to help more students receive a free education. Photo via SDCCD. A program that provides students with scholarships for community colleges will expand in 2017, San Diego Community College District (SDCCD) officials announced Saturday. 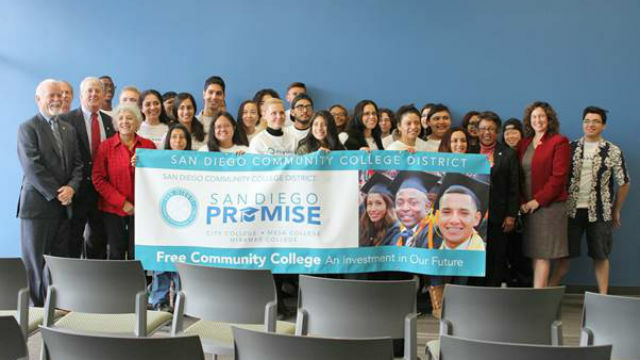 In the program’s second year, the San Diego Promise will more than quadruple to provide nearly 800 students with free college educations, said officials in a conference at San Diego Mesa College. The pilot program will add up to 600 new freshmen at San Diego City, Mesa and Miramar colleges, in addition to the 186 students already benefiting from the program, according to SDCCD. Seventy-five of the new scholarships will go to students from San Diego Continuing Education, the SDCCD’s adult education division. SDCCD officials said they will also grant scholarships to 10 freshmen from the Monarch School, which has focused on educating homeless youth for almost three decades. The application process is already open and accepting applications, according to SDCCD. Students from San Diego Unified School District (SDUSD) must apply by the deadline of Feb. 10, 2017. The applications are available at the SDUSD’s website. Recipients of the scholarships will be notified by Mar. 1, 2017. San Diego Promise pays for enrollment fees and books not covered by other forms of financial aid, according to SDCCD. The program was estimated to cost $217,724 this year. Recipients are required to be full-time students, participate in college orientation, map out an education plan, volunteer for eight hours and maintain a 2.0 GPA. Based on its warm reception, SDCCD expects sufficient donations to fund the second year of the pilot program, said Chancellor Carroll.